I seem to have been on a bit of a mock meat fest recently with visits to Enlightened Cuisine and now to White Lotus. White Lotus feels like an old school suburban Chinese restaurant of the type I visited as a kid. If you’re after nostalgia you’ll find it here, right down to the Lemon Chicken. But along with these classics there are some other fine dishes that you might not find in your old school local. All the dishes on the menu are vegan. There were about 10 of us and 5 ordered the banquet, while the rest of us ordered individual dishes. 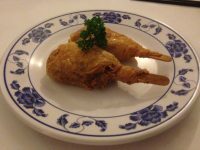 We started with some “chicken drumsticks”, mock chicken enclosed in a crispy bean curd skin. 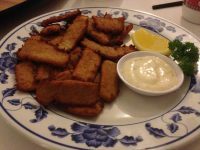 We then followed up with fried calamari, a roast duck dish and I managed a taste of the tamarind fish. The calamari was OK, though not earth shattering, though the scoring on the calamari was amusing. I’m always amazed by how much trouble the Buddhist mock meat makers go to recreate every facet of meat in texture, flavour and preparation. But the duck and the fish were really good. If I have a complaint, there are almost no vegetables with any of the dishes. The duck at least came with some snowpeas and beanshoots to help balance the mock meat avalanche. This is one reason why I ordered it, and it was a great choice, crispy on the outside and tender in the middle. 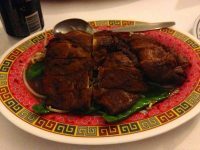 The tamarind fish was also good, with a crispy skin of seaweed, beancurd and a soft flaky interior, all given a wow factor by the spicy, sour tamarind sauce. 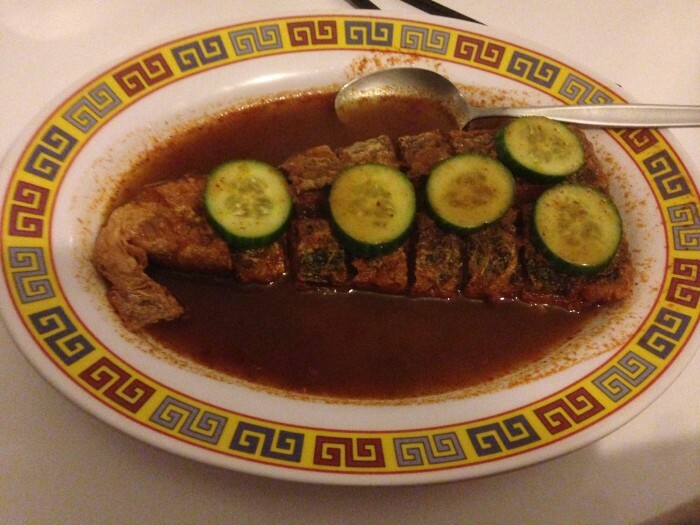 I love that tamarind fish! I’ve never seen another mock meat quite like it. You know what? I haven’t even been to White Lotus since I went vegan! I’d actually forgotten about it. I used to work right near there with a vegan, so if she organised the lunches we’d go there. The problem was that I always seemed to have some reaction to something – my nose would be bright red for the rest of the day! Weird. I should give it a go again and see if that still happens.